Hear what our patrons have to say! Please read on to see what people are saying about our Fort Beale RV Park in Kingman, Arizona! "We came to Kingman 3 years ago as full time RVers. We checked all the RV parks in the area. Fort Beale RV Park has it all, clean restrooms, laundry room, cordial atmosphere, and the sites are clean and well kept. The pool is great to cool off in the summer. Overnight sites are pull through, so no hassle of backing into a site. The Managers, Vicki and Don, are friendly and helpful. 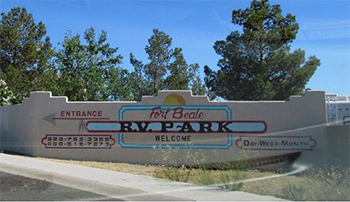 Fort Beale, is an RV Park you can truly call home." "We spent 2 nights at Ft. Beale and had a very enjoyable time. The restrooms were spotless all the time. The laundry was open until 9:00 PM which is nice for doing laundry after pulling in at dark. The Managers were always cleaning something. Fort Beale is now on our must stop list." We are committed to quality and excellence. We would love to hear your comments, suggestions, and praise! Please contact us today and let us know how we are doing. Thank you.